It seems to have been a perfect marriage of technology and demand of a product that gave us the largest, and in my opinion, coolest card set of all time. The 1886-90 N172 Old Judge set. Much has been written about this time capsule of a set. So many great poses and images. In fact, over 3000 different images. The set features baseballs on strings, strange background props and even a card with the first ball player giving the middle finger. That’s a story for another posting. This posting is about skinning of Old Judge cards. First, let’s look at what makes an Old Judge card. The cards feature a very thin albumen photos adhered to a thick cardboard support. The cardboard support is blank giving the cards a blank back. The fronts are real photographs, lending the possibility of incredible sharp imagery even after all these years. What is an albumen photo? Most everyone is familiar with the sepia photographs from the Civil war and post war era. We have all seen that warm brownish image of a solder posed stiffly, usually straight faced and with haunting eyes. Those are albumen photos. The special albumen paper was coated with a mixture of egg whites and other chemicals that made it sensitive to light. Once the image was imposed on the albumen paper and the image was fixed, the image was very thin and fragile and needed to be mounted on a backing. 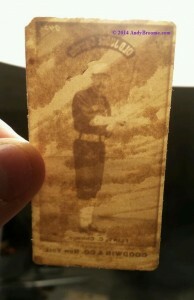 In the case of the Old Judge cards, the backing could become damaged over the course of 100+ years of handling. Sometimes if the cards were glued into an album and later removed, the cardboard backing would suffer paper loss and damage. Somewhere along the way, someone figured out that they could remove the thin albumen print from the damaged backing and then re-back the image to a new back. Because the albumen is so thin, sometimes it would bend over creases in the cardboard and not break the surface. So the potential of taking a card that is damaged from poor condition to an apparent EX condition was possible. Some re-backings are easy to spot but there are some that can be difficult at first glance. The card featured in this posting is the albumen image itself, absent a backing. This card appears to have suffered damage that separated the two. As you can see in this image, the albumen image is being held up in front of a light source. You can easily see the light through the picture. The striations of darker color in the image are remnants of the cardboard backing. This particular image can be holdered. It would be Authentic Only and the label would notate that the back is missing.